Heated outdoor swimming pool, open May to the end of September, Poolbar and fitness center. The GOURMETBAR by Novotel is an informal setting where you can eat simple, tasty, healthy and balanced cooking and enjoy a drink in a friendly atmosphere. BOCO allows you to eat food prepared by three-star chefs at a moderate price. Whether you want a quick coffee and croissant, a pre-lunch or dinner aperitif, appetizers or just a refreshing cocktail, the Gourmetbar by Novotel is open daily from 6:30am to midnight. During the summer months, our open-air "Poolbar" offers regional snacks and wines, ice creams and refreshing drinks. The manager made it difficult at check out for me to leave one big piece of luggage at Novotel. I’m back in 3 days - so I’m not exactly abusing of the luggage storage room. In the end, all was arranged and I was able to leave my suitcases. Too bad it happened at check out because it’s often the experience you remember of a hotel. I have a gold card but I could not have any upgrade neither a late check out a 2 pm .in the room there was only a tiny towel and a middle one.At the reception they were not so kind I did not felt absolutely a special gold guest.the room was a very noisy one because was over a building site .of course it was not certainly one of the best.the restaurant was very good and the waiters really kind. Dear Guest 912 faustag, thank you for posting a comment on TripAdvisor. We are glad to read that you appreciated the Restaurant offer and our Service. As you certainly notified during your stay in our hotel there was a big International Congress on going and that fore an upgrade as so as a late check out was not possible during this dates also we have to mentioned that the upgrade conditions are clearly defined as an up grade is given upon availability. We hope to welcome you soon again for one of your next stay in our Hotel and please don’t hesitate in contacting us in advance under H6776-AM@accor.com in order to check personally the upgrade availabilities for you. Thank you for given the preference to Novotel Lugano Paradiso. Sunny regards Christian S.
Good especially Alberto upon check in. Excellent welcome, I had a few difficulties to sort out and the reception team couldn't have been more helpful. Warm welcome, every assistance was provided to me to make me welcome. I would recommend anyone to stay there. Nice facilities, very friendly and attentive staff, super dog friendly hotel! We had our dog with us and felt very welcome. Stay in Lugano was great , unfortunately for me to short! Everything was fine but rest/bathroom swing doors cannot be closed : no intimity. Construction works west and east side: ask for a quiet room. Very nice breakfast. Professional staff serving very good italian coffee. Dear RodrigGirone, Thank you for this nice review given to our hotel. We are glad that you enjoyed your stay at Novotel Lugano Paradiso and hope to welcome you again very soon. Kind regards Christian S.
There are no water, no slipper inside rooms. I enjoyed my stay at your hotel, from the welcome I received on arrival to my departure. The room was clean and comfortable, the breakfast was excellent with a good choice of food. It is a perfect accommodation for a Business Trip! - Nice and quite new rooms with all the necessary amenities you can expect. - Especially to mention: * The &quot;Jungle Shower&quot; - I am loving-it! * Variety of pillows - There is a bar for the most meaningful discussion during a business trip. - The Breakfast Buffet deserves his name - you get anything you can wish for. - Express check-out: Just drop the card in the box in the morning. Staff is very helpful and friendly but you should not overload them! Very friendly and helpful staff. Combined with the freshest and nicest Novotel we have ever been to. We had a beautiful weekend! This hotel gives you a real Holiday feeling! Although it was November the atmosphere of the hotel and envirement near the lake is perfect to relax. 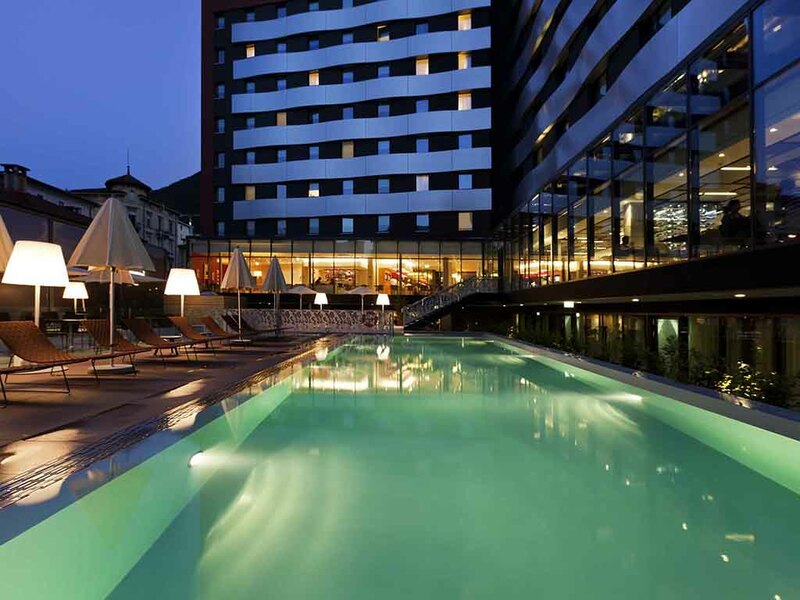 Lugano is a very nice city and Novotel offers you perfect accomodation. The staff is always greeting me with smiles and good service. Best breakfast in the town. Clean room.